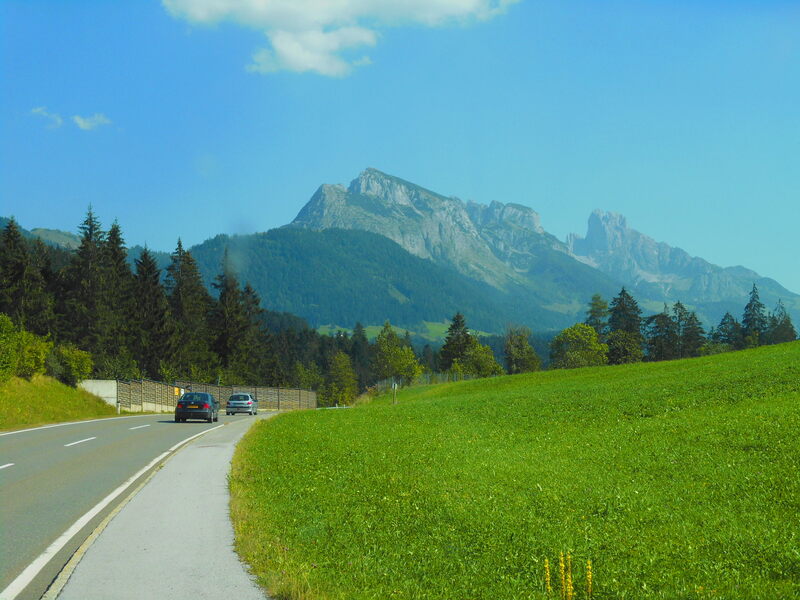 Austria seems to have a few quirks – one of which is the road systems. It seems on a two lane road if the speed drops to below 50 miles per hour then the traffic immediately filters to either the outside lane or the hard-shoulder. This leaves the inside lane free for emergency vehicles but also stops all the lane jumping you usually getting in slower traffic. As soon as things speed up everyone filters back out – sad but true that we are mega impressed, so much so we love seeing a bit of a hold up ahead! Despite some low cloud we followed Gerlos Alpine Road over the mountains, passing the Krimml waterfalls — the highest in Europe and 5th highest in the world. The road only opened in 1964 and closes in November due to snow, until then its motorcycle heaven with all the cafes, guest houses and car-parks trying their best to attract some of the hundreds of bikers who visit each day. At the top of the pass we reached over 5000 ft, turned a corner and we reached a toll booth! As we have a vignette we were a bit surprised and agreed if it was too expensive we were going back – well maybe not as it would have been about about a 60 mile diversion. It was only €8.50 so we paid up and took the downward slope and into Gerlos, a very traditional looking ski village with plenty of expensive shops and bars. 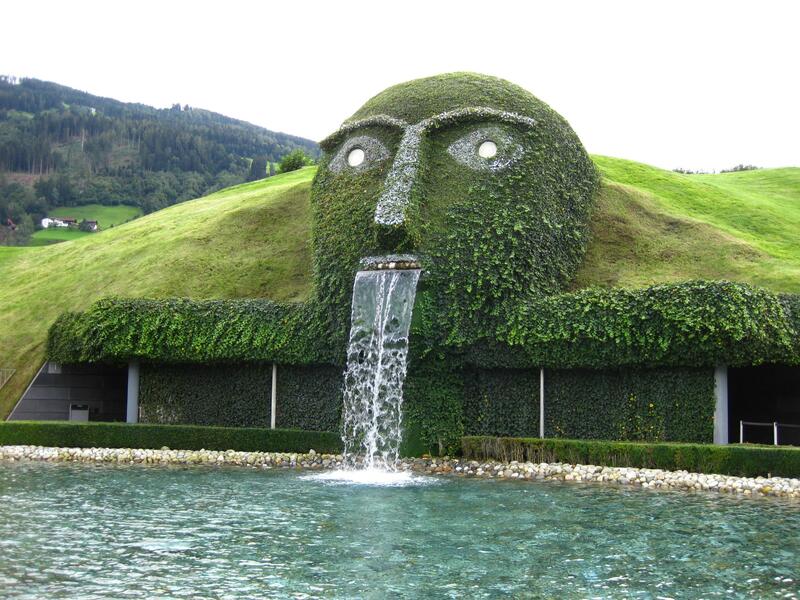 With more rain on the horizon we were looking for something to do that didn’t involved a castle or museum but kept us dry -Swarovski Crystal World in Wattens was a perfect fit. Built 20 years ago to celebrate 100 years of the Swarovski company, describing it as a museum would be wrong, there is only one room with old artifacts and really nothing about the history. It is called an experience – you enter under the waterfall that runs from the mouth of the giant and inside there are 15 unique “Chambers of Wonder” – a very apt description of what is there. 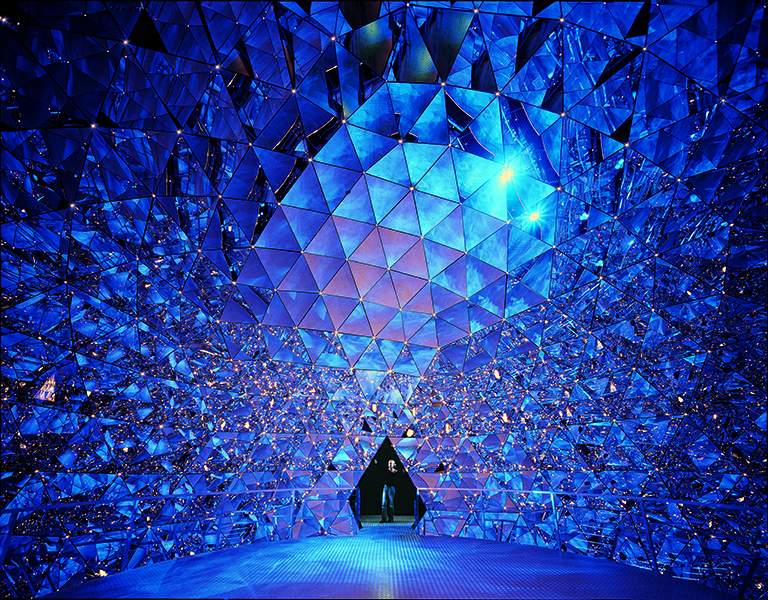 Each chamber has been designed by different artists and use crystals and glass in some very unique and mind blowing manners. My favourite was the Crystal Dome, 595 mirrors in a geodesic dome that creates such a feeling of depth it feels (and sounds) as if you are inside a crystal. Music composed by Brian Eno plays in the background and as the colours in the glass change from time to time hidden art objects appears behind some of the mirrors. One of the most amazing man-made objects ever – worth the entrance fee on it’s own. Every installation is very different, classical sculptures in crystal, clouds containing crystal rain drops, forests made from crystal and glass where you feel trapped in a 3D world and so many others it would take the whole blog to describe it. There is of course a large Swavorski outlet shop, nothing cheap there but a massive selection for those with big purses. Outside there are further sculptures along with a giant maze and a pool that you walk into by way of a pathway giving the impression to onlookers you are walking through the water. Despite it costing €19 to get in it is without a doubt one of the most fabulous places we have been to. 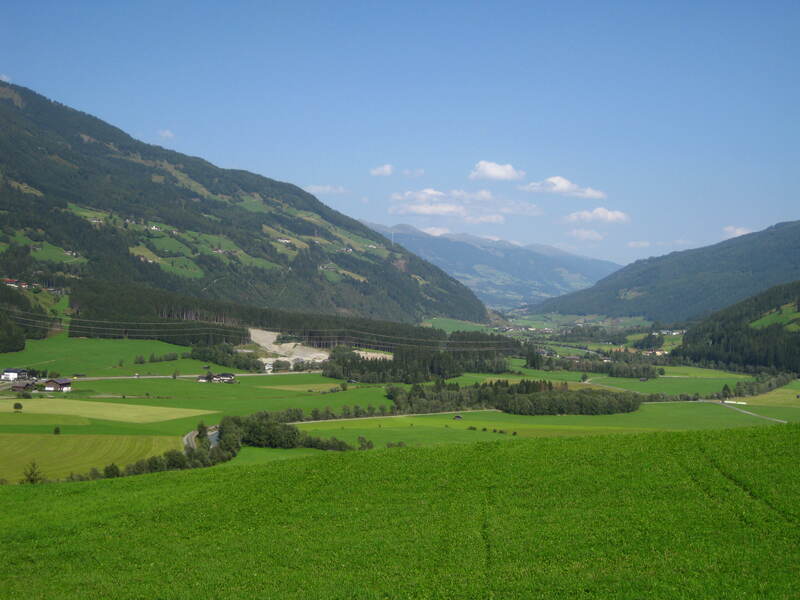 Our plan was to visit Innsbruck, we drove in and drove out. We expected a ski town, it was just like any other very large town and not what we were after. 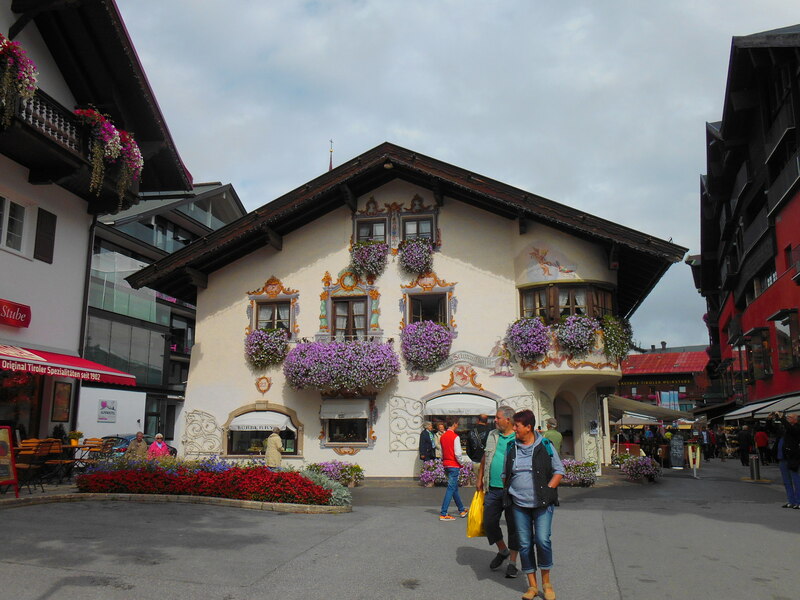 We remembered a comment on here about Seefeld so set off there instead. Up in the mountains a small ski village that is just perfect for us at this time of year; plenty of quirky little shops, quaint hotels, cuckoo clocks galore, horse and carriage rides and cafes with oodles of struddles . A lovely campsite on the edge of the village, the most expensive site since we started out 10 months ago. 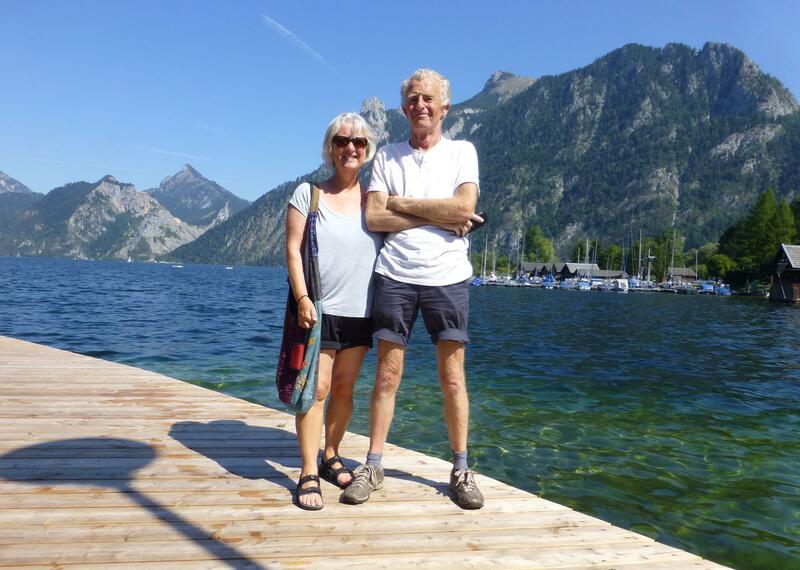 That said we both think its great, Iain has been making regular use of the sauna, the restaurant serves very, very good food (on a wet day the best comfort food ever – Tiroler Grostl) – its all so good we have been here for four days. Continuing the theme of “I hate heights so why are we in the mountains?” we went up in the ski lift to 5000 ft. My nerves were shot to you know what, I believe clinging on to the hand-rail will save me if the cable snaps – I did do no hands for a split second to take a photograph, just the one :). 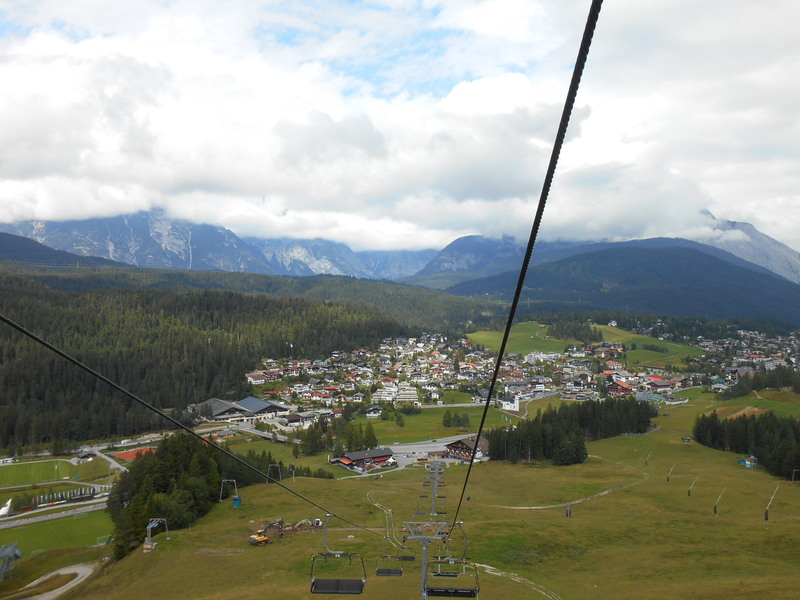 Seefeld is a very popular resort with British walkers, we met a couple who have been coming for 11 years, they were surprised we were using the lifts and not walking – we were surprised you would walk that far up a steep hill if you didn’t have to. The sun popped out for half an hour whilst we were in the mountain restaurant having lunch – the views absolutely made up for the terror trip up there. Made it both ways 🙂 We went how high ?? It’s been our first few days of poor weather for months, the sun has peeped out now and again but the first snows of the season fell on the slopes above us during the night. We did venture out today for a decent walk, following one of the many Nordic walking trails down the valley and back. Back of camp now planning on moving on tomorrow before we take root here. No sign of Julie Andrews – yet! 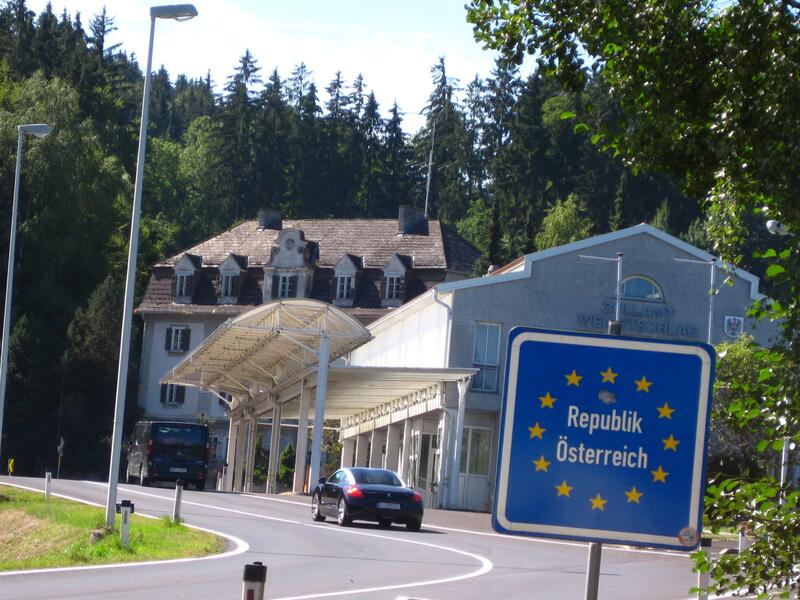 As usual Sunday was border crossing day – we trundled over the mountains and arrived in country number 19, Austria. 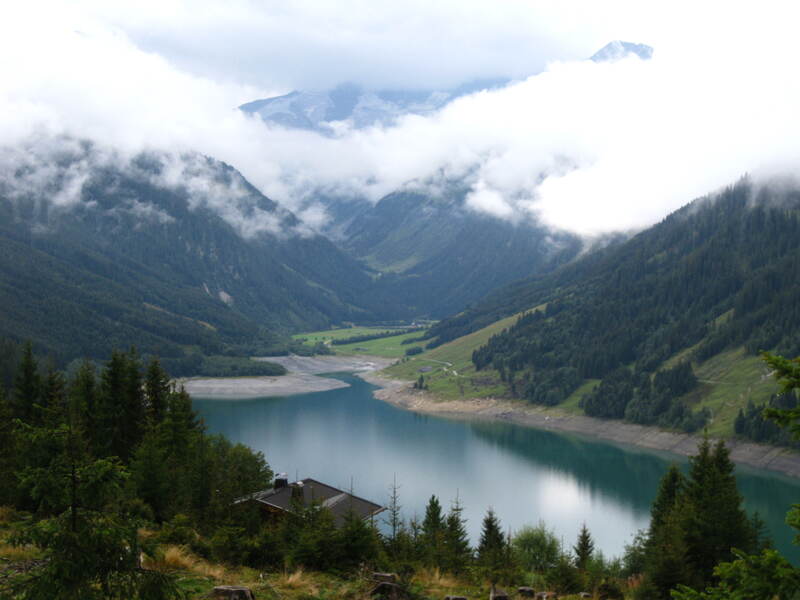 A few things changed, the currency of course – back to Euro, but more so the scenery. The houses grew bigger, the balconies became full of flowers, the mountains became higher and the road surfaces became quite frankly smoother than your average babies bottom. 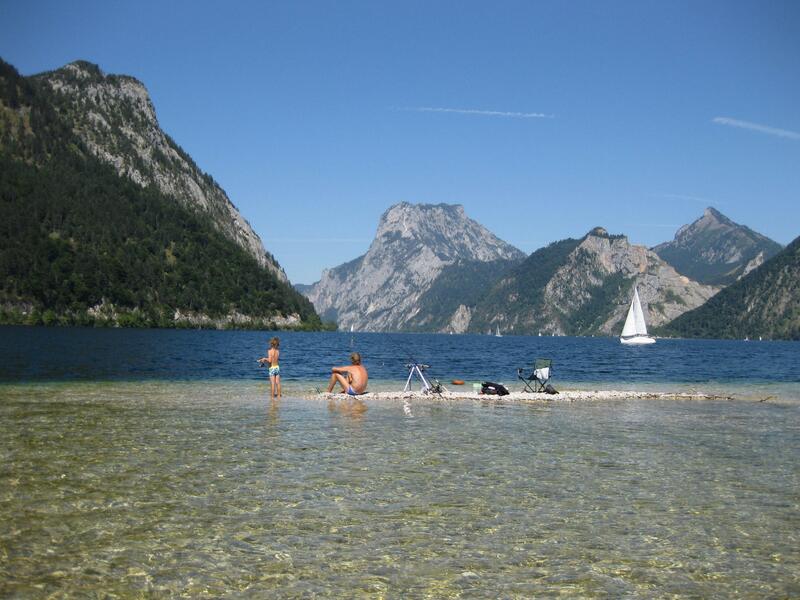 Stop one was at Ebensee, in the Salzkammergut mountains. We drove around Lake Traunsee and saw more people and cars in an hour than we usually see all week. The weather was playing its part for sure as people were parked up and swimming everywhere. We found a small stellplatz near the lake, parked up for a walk around the village and a quiet over-night. Mistake there then, at 9.25pm the air raid sirens started. We had no idea what was going on, Iain half asleep said maybe its to tell you the dam has burst!!! We waited, no one seemed to panic or move so we stayed put even though it had put the fear of God into us (we found out later that they use the siren to muster the volunteer fire brigade). 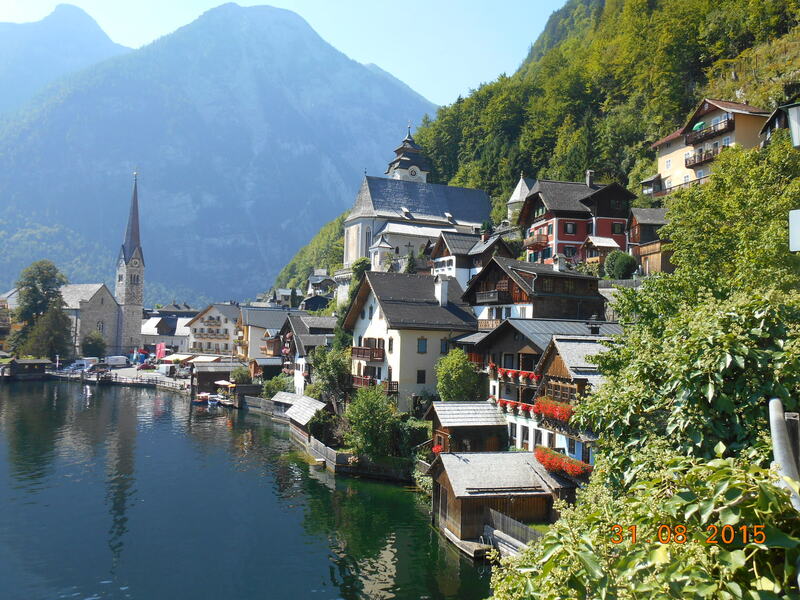 Looking for a ‘must see’ village we chose Hallstatt – known as one of the ‘most beautiful villages in Austria’, always a sucker for the tourist blurb we were there bright and early ready to say it wasn’t that special. How wrong could we be? 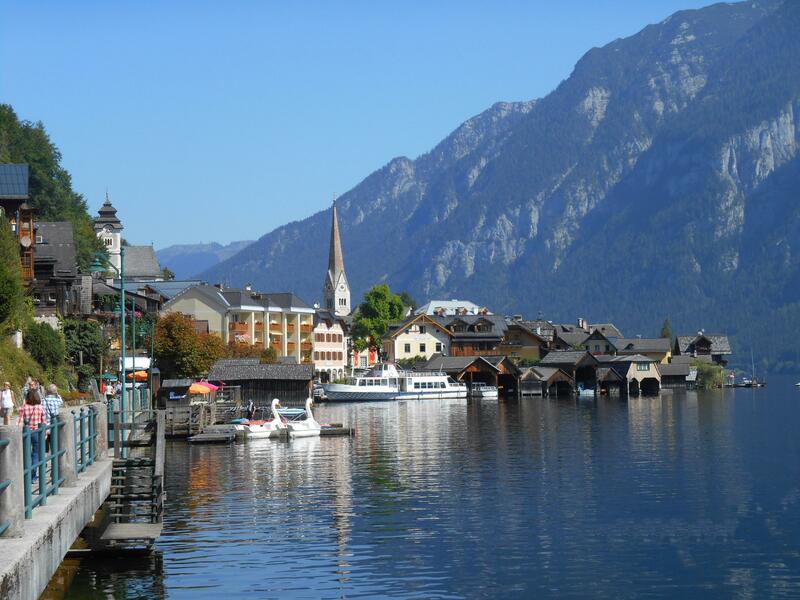 it deserves all it’s accolades – set on the side of the Hallstatter See (lake), wooden houses clinging to the side of a mountain, flowers trundling out of window boxes, cafes with gents dressed in their lederhosen – really the classic Austrian village. It was only possible to reach the village by boat or rough trails until just over 100 years ago when roads were blasted through. The village has 940 full time inhabitants, and something like 3000 visitors based on the people milling around the teeny lanes. Many, many were Chinese, and they could have saved themselves a big trip, a complete replica of the entire village was built in the Chinese town of Huizhou China in 2011. 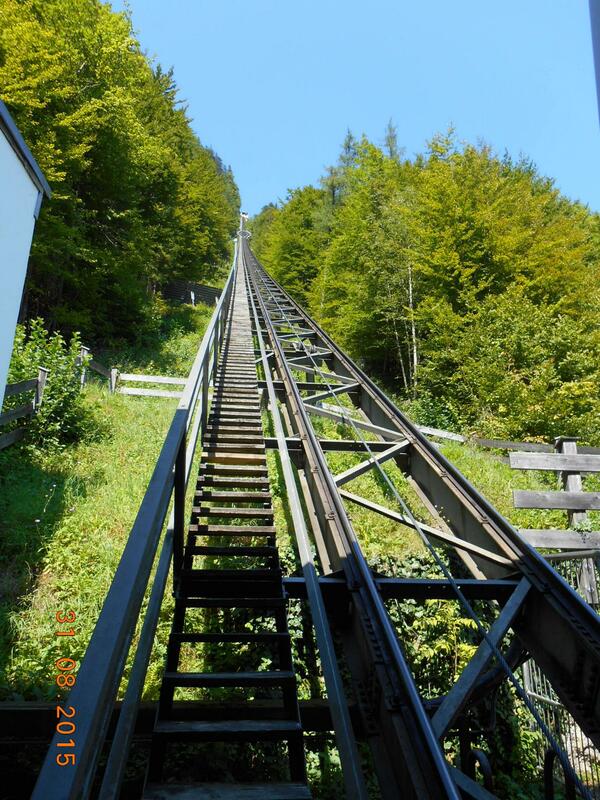 On the edge of the village is a funicular railway up to the salt mines, it looked steep but we bit the bullet and got on. It was, quite simply, terrifying – no not just me, several small German children (aged about nine) stood with me, facing the back, refusing to look down. 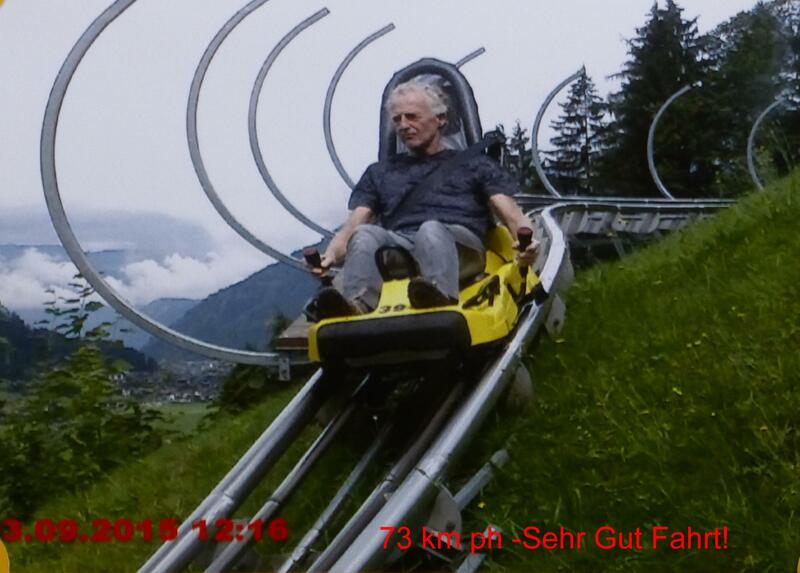 It shoots up the hill like a bullet – then it meets the other one coming down and suddenly slams on the brakes, I am amazed I paid to be scared half to death. If that hadn’t been enough then according to World Heritage “everyone needs a bit of excitement” and to give you that they have built a viewing platform that extends out from the mountain and hangs 350 metres (1150 ft) over the rooftops of the village. In the spirit of already feeling like my knees were about to collapse I made the “Sky Walk” – I stayed long enough for a photo and was off, Iain on the other hand was a cocky sod and even did a few aerobic poses whilst taking some panorama shots of the views. Brave or stupid – who knows? So many castles to chose from but Hohenwerfen Castle appealed firstly because it was an 11th century castle high on an imposing hill towering over the villages. Secondly though, we do like them to have some current history and this one was the setting for the film Where Eagle Dare and main backdrop for the song “Do-Re-Mi” in the Sound of Music. We expected some mention of either or, nope not a one. The castle is reached by either a 20 minute slog up the hill from the car-park or (yet another) funicular railway. Great! it was hotter than hot so we went for the railway, this one was even better you pushed the buttons as if you were in a lift, not as high though and certainly easier than the walk. The castle was a little under-whelming inside, a few exhibitions of contemporary arts, a museum relating to birds of prey and hunting and twice daily falconry displays. Clint Eastwood, Richard Burton and Julie Andrews and I have graced these hills! 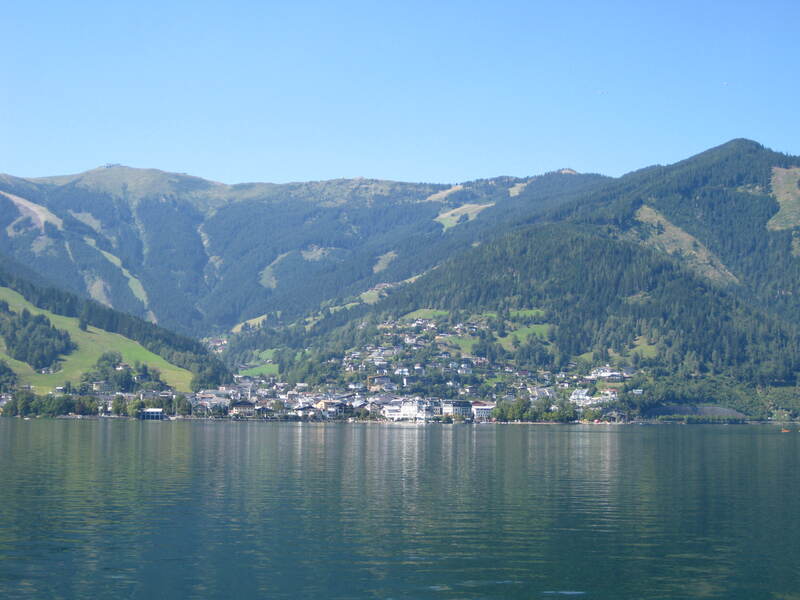 Zell am See was next on our list, one of the most popular ski resorts in the area. Being one of the hottest days of the year it was all about sunshine and the lake, the ski lifts were running but we really couldn’t muster the effort to do anything other than sit on the opposite side of the lake and look back at the village.